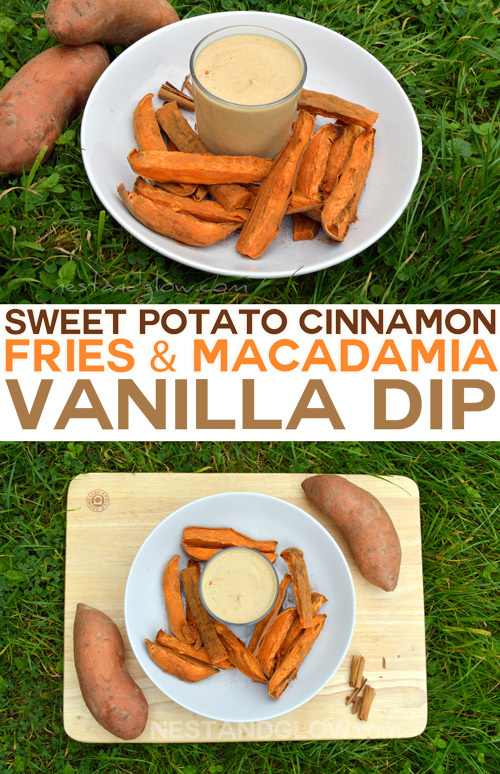 These Sweet Potato Cinnamon Chips have no sugar or oil added, are oven baked and served with a macadamia vanilla dip that is sweetened with just fruit. Try this easy, delicious and healthy recipe today. No need for any refined sugar as the potatoes are sweet enough and all the dip needs is a few dates to make this a desert that will satisfy any sweet cravings. This can be enjoyed as a sharing desert for a couple of people. The vanilla macadamia dip is dairy free but creamy and rich from the nuts. If you don’t have macadamia nuts then cashews work just as well. I like to use macadamias as they are very high in heart healthy fats and give a similar taste to almonds but without all the hassle of pealing and soaking. There is no need to soak the macadamia nuts for this recipe. Cut the ends off the sweet potatoes, cut in half and then cut these halves into 8 chunky chip sized pieces. Two large sweet potatoes should make 32 chips and fill up an oven tray. You can do smaller ones but larger ones are much quicker to do and make a chip with a fluffy centre. Place on a non stick sheet and bake in the oven for about 40-45 mins at 450 F / 230 C until cooked. 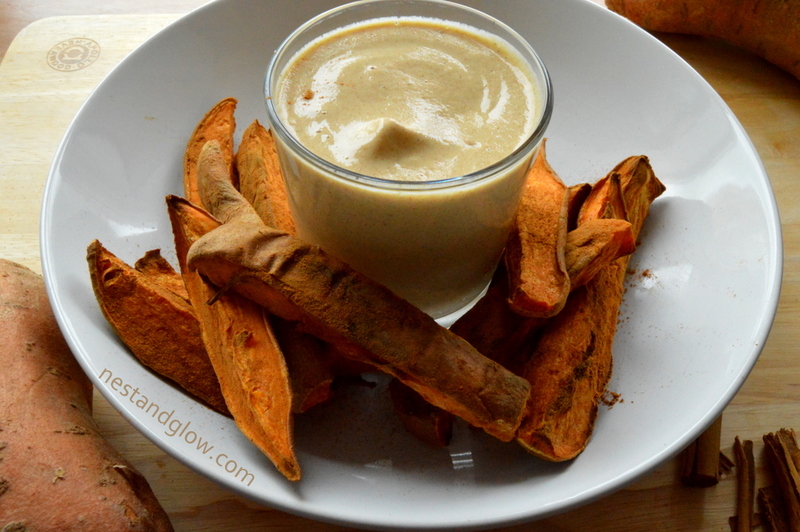 While they are baking put everything else apart from the cinnamon into a blender and blend into a smooth dip. Once the chips are cooked sprinkle on the cinnamon and toss them until they are all coated. Serve immediately with the dip. Any left overs will last a few days in the fridge. Would it be possible to use parsnips in lieu of (or in addition to!) the sweet potatoes? I’m certain that would work and be delicious!